Ed creates many different and unique things in his shop, and sometimes he assists his grandchildren with projects of their own. Ed's grandson Brendan builds his school project, a mosquito. 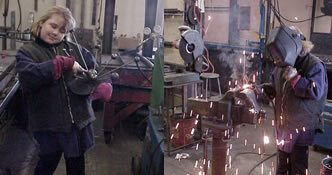 Ed's granddaughter Leah builds her school project in the shop - a welded ant. Here's Ed's late grandson Cody, who passed away at the early age of 8 on August 19, 2004 after a tragic bicycle accident. Cody loved to build in the shop, and was very creative as well. Cody would come to Ed with new ideas and they would always be cool! Cody is shown with his sister and the Spider-Man gate he helped Ed create. Spider-Man was Cody's favorite superhero. Ed working hard on a customer order in the shop. Here is Ed's granddaughter Cassie, helping Ed make a bed she designed from scratch, along with the finished product. And here's Ed's other granddaughter, Paige, creating a solar system for her school project.